By Scott Snyder: Columbia University Press, January 2018. 376 pp. 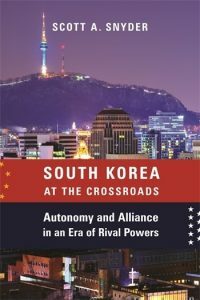 In South Korea at the Crossroads: Autonomy and Alliance in an Era of Rival Powers, Scott Snyder begins with a framework to contextualize South Korea’s strategic interests, including its North Korea policy. He argues Seoul has sought to balance alliance and autonomy as well as “inward-focused parochialism” and “economic-interdependence-driven internationalism” (6) to chart the evolution of South Korea’s approach to the North and wider world. Specifically, he identifies three drivers of South Korea’s external policy: the geopolitical context on the Korean Peninsula, South Korea’s capacity and relative power, and domestic factors, especially since democratization. Snyder details how the geopolitical environment around the peninsula has shifted from hostile in the early Cold War to relatively benign in the late Cold War to tense again in the mid-2000s. South Korea’s relative capacity has grown steadily, peninsula-focused parochialism gradually replaced with internationalism, and alliance dependence shifted to alliance partnership. Seoul’s domestic politics has been a factor but the least important of the three structural drivers, he notes. Snyder’s argument focuses on an evolution on the Korean Peninsula, so it should be no surprise that he dedicates most of the book to a chronological evaluation of South Korea’s external choices, weighted to give more attention to contemporary periods. He provides a chapter each to the authoritarian period (1948-1987), the democratizing administrations (1988-1997), and each of the next four South Korean administrations. The book then shifts to thematic chapters, including one on unification. While this structure of chronological and thematic discussion creates some redundancy, it also allows the author to delve more deeply into his own analysis of these important topics and permits the reader to focus on areas of his or her particular interest. Snyder persuasively argues his framework and three drivers of South Korea’s foreign and inter-Korean policy dates back to the Korean War. South Korea’s first president, Syngman Rhee, sought American alliance commitments after the Korean War to bolster his military power vis-à-vis North Korea and ran headlong into American constraints opposed to Rhee’s advocacy to reunify the peninsula by force. His nation’s weakness at the time limited Rhee’s autonomy. South Korean President Park Chung-hee was more “wily” in his effort to influence the alliance, built up his own autonomous military capabilities, and demonstrated his self-help approach to North Korea through direct dialogue. The tense geopolitical environment surrounding the peninsula and Seoul’s relative weakness prompted a heavy reliance on American decision-making on peninsular affairs. As South Korea democratized and relative power grew, Snyder describes how Seoul advanced an autonomous inter-Korean Nordpolitik strategy in the 1980s and 1990s as North Korea faced greater international isolation. Democratization at this time injected new interest groups into South Korea’s decision-making, and Presidents Roh Tae-woo and Kim Young-sam expressed frustrations about US-DPRK negotiations that seemed to bypass Seoul precisely when it grew more powerful and expected a louder voice on North Korea-related issues. The geopolitical environment grew more favorable to Seoul, and it wanted a more significant role in shaping events on the peninsula. Into the 21st century, South Korea continued to expand the relative capabilities gap with North Korea, especially on economic and even conventional military metrics. In this more benign environment, Seoul had greater ability to affect the future of the peninsula, but democratically-elected leaders showed a range of preferred approaches to the same goals of North Korean denuclearization, improved inter-Korean relations, and eventual unification. Snyder elaborates on the distinctions not only between South Korean progressives and conservatives but also between and among each administration. He shows that the influence of the third driver of South Korea’s approach to the North, domestic politics, is most readily apparent in this period. Snyder turns to thematic elements in subsequent chapters, providing a useful perspective on South Korea’s status as a middle power as well as its position between the United States and China. The North Korea focus returns with a full-chapter discussion of unification. Rather than an actual policy “objective,” unification is an “aspiration,” he says. South Korean administrations face domestic political pressure to identify a unification strategy, which affects the country’s foreign policy, but the lack of a consistent unification vision across society and contrary interests of regional powers precludes a consistent long-term effort. He concludes that, “unless North Korea either cooperates or collapses, unification is likely to remain distant and unfeasible” (260). If North Korea watchers are looking for one book to read on South Korea, this is it. Snyder’s balanced analysis, readable style, and insightful and bold conclusions make South Korea at the Crossroads a tremendous contribution. Snyder’s framework is clear, jargon-free, and explains a dynamic history of Seoul’s foreign and inter-Korean policy. His diplomatic history is well- researched and focuses more on the narrative of Korean history in context than trying to prove a discrete theory. At a time when US-ROK solidarity on North Korea policy is particularly important as the countries pursue parallel diplomacy with Pyongyang, Snyder provides timely perspective on past differences between the allies on North Korea policy and their effects. South Korea at the Crossroads offers the generalist a firm foundation on South Korea’s external policy and Korea specialists an opportunity to reacquaint oneself with the full history and gain a new perspective on core issues affecting the peninsula. This book is not to be missed.